Giving up refined sugar has created some tough moments. First? The headaches. Oh my lord, the headaches. This is why I’ve failed at giving up sugar before. Beyond the cravings and the noise in my head, the very real physical pain when I give up sugar is incredibly difficult to deal with. A violent, throbbing, and untouchable headache showed up the first four days of the CoreLife Challenge. It hit around 3 PM. From experience, I know that eating a hint of sugar will take it away, so I’m constantly fighting against giving in. Yes, the long-term benefits will outweigh the short-term relief and all that good stuff… But who cares about that in the throes of a mid-afternoon meltdown!? What I want is to grab a candy bar, fast food, or a creamy iced coffee with sugar. Instead, I have something protein-based. I need to have it in my car because that’s where I am usually at around this time of day. So I gulp down lots of water, and make a very conscious decision to eat pumpkin seeds and a protein shake. I keep magnesium nearby and breathe through it. I also ask my family for patience with me – I’ve been very crabby! On day 5, blessed relief comes. The craving is still there every afternoon, but the headaches are gone! Glorious! The strategy has remained the same all week: have something available in the car as a pre-emptive strike to combat the cravings. Everything I read on the matter promises me they will disappear at some point, but it’s very hard to believe right now. As week one ends, I’m feeling proud and know I did good work. It’s certainly not easy, but it is absolutely worth it, especially if I can beat these cravings, bring down my blood sugar numbers, and get back to sleeping through the night. Problem #1: I constantly indulge my cravings. Solution? No more sweet protein bars at breakfast. Real, actual food is required. I’ve also been using plain balsamic vinegar on my CoreLife Eatery salads instead of dressings. Also, I gave up lemonade for plain tea and do not indulge in a sweet iced coffee after my meals. Lastly, no late-afternoon indulgences – I’ve been sticking with my pre-emptive strike of food in the car with success. Sounds terrible, right? Well, it has not been an easy week. But here’s the kicker: the breakfast…the balsamic…the tea…the coffee. It’s all freaking delish! By the end of the week, I’m feeling pretty great about my choices. They still require self-awareness and intention, but I am not grumpy about it, nor do I feel deprived. Problem #2: I don’t eat frequently enough. This sounds like a non-problem, but it most certainly is problematic. I tend to eat like a snake – once a day in large amounts. I’ve learned that eating frequently is smarter because it allows the body to digest and converts the energy I’ve given it, keeping my energy and blood sugar (hello, insulin) at an equilibrium. As a pre-diabetic, I realize how vital this is for me! So I decide to plan. I’ve been buying a second salad or a bowl of soup to go after I finish my lunch, and I know I have something for dinner that night or lunch the next day. And I don’t have to prepare it! 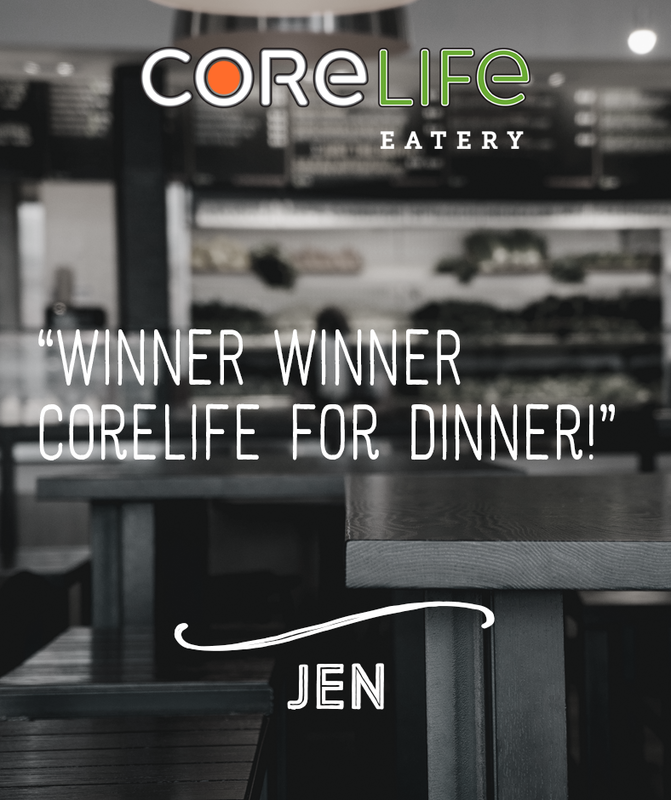 Winner winner, CoreLife for dinner! This has been an awesome solution for me – I love the easy button! Some benefits include my mood is more even, my energy doesn’t wane, and I’m actually eating less. I get full very fast these days. Ultimately, this has not been an easy week. But, I feel I’m heading to the other side much more quickly than I expected!